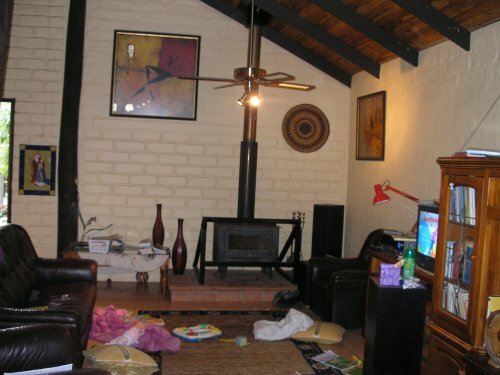 We have a simple yet sophisticated mud brick home, built of clay dug from the two-acre property. 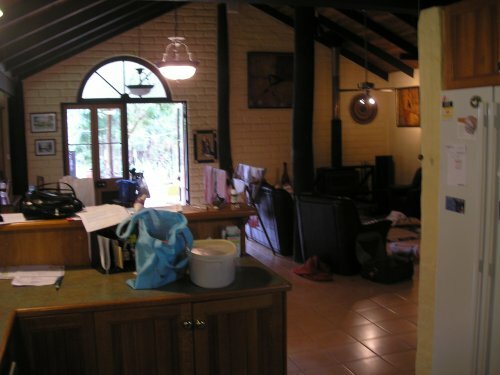 The house has cathedral ceilings with exposed rafters, a spacious, open living area with tiled floors and a well equipped kitchen. Large windows provide generous views of the surrounding bushland. The external spa (hot tub) is a wonderful place to relax. In July/August, day-time temperatures are about 22 degrees, with nights down to 10 or 12 degrees. Days are usually sunny but we frequently light a cosy log-fire in the lounge fireplace as evening approaches. Our home is 40 km north of the Brisbane CBD adjacent to the Bruce Highway that connects Brisbane and Cairns. It takes less than an hour to drive to Brisbane city, or half an hour to the Brisbane International Airport. 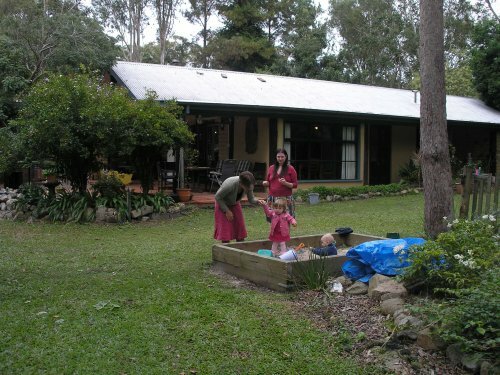 Ours is one of twenty or so semi-rural/bushland properties on a quiet no-through road in a rapidly developing part of greater suburban Brisbane. Many of the acreage properties here contain bushland, encouraging birds, possums and some koalas to remain between the built-up zones. Most residents have lived here for 20 or 30 years, and it is a safe, friendly place. You may even be asked over to a neighbour's house for a convivial glass of home-brewed beer! Supermarket shopping is nearby and there is a well-equipped gym and Olympic-sized pool a couple minutes away. You will enjoy the home's privacy, hot spa, peace and quiet, and easy access to the many north-Brisbane attractions: we are 30 minutes' drive from beautiful beaches at Redcliffe and Bribie Island, while the renowned Sunshine Coast beaches, Australia Zoo and scenic destinations are an hour away. The Sunshine Coast hinterland boasts mountains, arts and crafts, forested National Parks, and gentle rural areas. The centre of Brisbane, with its scenic and cultural attractions and excellent restaurants, can be reached either by car or train (the train station is a five minute drive from our home). The Gold Coast attractions can be reached in an hour and a half drive, or by connecting trains. Driving two hours west will take you to farming areas, where you can visit small rural towns and get a feel of Australian country life. Homestays on rural properties are within easy reach. We are a professional couple about 60 years of age. Anne holds a senior position in education, while Bob is a university research academic. We enjoy bushwalking, rural areas and beaches. City attractions are also good. We enjoy experiencing other cultures. We have five children (three in Brisbane) and four grandchildren. Please contact us if you might be interested!